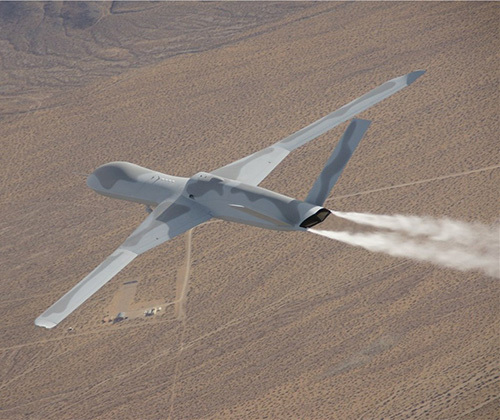 General Atomics Aeronautical Systems, Inc. (GA-ASI) has set a new endurance record with its Avenger® Extended Range (ER) Remotely Piloted Aircraft (RPA). On January 24-25, the next-generation Avenger ER flew 23.4 continuous hours in a representative Intelligence, Surveillance and Reconnaissance (ISR) configuration while carrying out a simulated reconnaissance mission. “Avenger ER continues to meet and exceed its development goals. By setting this new high endurance mark, we have demonstrated the tremendous capability of this aircraft to our customers,” said David R. Alexander, President, Aircraft Systems, GA-ASI. With an increased wingspan of 76 feet, Avenger ER extends the legacy Avenger's already impressive endurance. The RPA provides an optimal balance of long-loiter ISR and precision-strike capability, supporting a wide array of sensors and weapons payloads to perform ISR and ground support missions. There are several other improvements on the Avenger ER which include increasing the maximum gross takeoff weight (MGTOW) to 19,500 pounds using a co-cured composite center wing and heavyweight landing gear as well as integrating a game changing dual redundant, light weight brake control capability using a GA-ASI developed lightweight Hybrid Linear anti-lock brake system. Like the legacy Avenger, Avenger ER features avionics based upon the combat-proven Predator® B/MQ-9 Reaper®, has 3,000-pound payload bay, and is capable of flying at over 400 Knots True Air Speed (KTAS). The Avenger fleet is designed to carry payloads such as the all-weather GA-ASI Lynx® Multi-mode Radar and the MS-177 Electro-optical/Infrared (EO/IR) sensor. General Atomics Aeronautical Systems, Inc. (GA-ASI), an affiliate of General Atomics, is a leading designer and manufacturer of proven, reliable Remotely Piloted Aircraft (RPA) systems, radars, and electro-optic and related mission systems, including the Predator® RPA series and the Lynx® Multi-mode Radar. Celebrating over 25 years of aviation innovation, GA-ASI provides long-endurance, mission-capable aircraft with integrated sensor and data link systems required to deliver persistent flight that enables situational awareness and rapid strike. The company also produces a variety of ground control stations and sensor control/image analysis software, offers pilot training and support services, and develops meta-material antennas.